Allysse camped out while hiking on the Vanguard Way that runs from London to the south coast. In her post she uses quotes from an essay by Robert Louis Stevenson to illustrate her journey, a nice idea. An audio diary is coming soon as well. James and his friend Karl camped out by Belas Knap, a neolithic long barrow, on Cleeve Hill, near Cheltenham. They enjoyed a couple of ciders while watching the sun go down, that’s how to do it! Naomi and her husband made their way to Dartmoor for a night out with bivvys. Chris combined a wild camp with sharpening-up his bushcraft survival skills by building his own shelter in the woods. Jacqui, her husband and dog camped out in the foothills of the Majella of south-central Italy. Amongst other things they enjoyed a fabulous looking fried breakfast, oh my! Maxine took her bike for a solo wild camp on the Norfolk coast. Anita spent the night in a Peak District cave after a hard day’s mountain biking over the hills. Nigel took to his canoe for a microadventure wild camp on the Caldon Canal, near Stoke-on-Trent. He shot a nice video and wrote up a blog post. A canoe wild camp is most definitely on my list of things to do this year! Over in Ireland, Stu camped out beside a lake. Tim and his mates Matt and Alex, went to the woods of Greenham Common in West Berks for a night under the stars. Charlie camped out in a wood while cycling on the Capital Trail up in Scotland near Edinburgh. Clare took her family off to the excellent Wicken Fen wild camping site. I camped there back in February, it is a fantastic place. Clare also managed to get a spot of geocaching in, impressive! Lee and his friend Andy cooked up a dinner of Thai chicken curry in a local wood. Curries are always good but in a wood at night…sublime. I took my son, his mate and his mate’s dad on a bushcraft weekend in the woods of west Norfolk. The boys learnt how to make fires and carve wood while the dads lazed around in hammocks and knocked back a few beers. 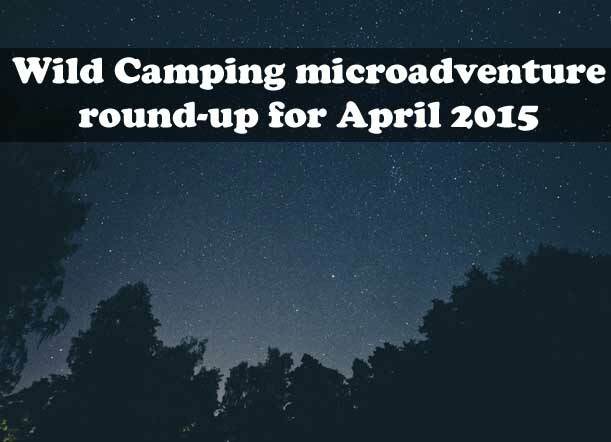 Did you manage a microadventure wild camp in April? Do you have one planned for May? Thanks for featuring my blog post. Really enjoyed reading your round up and delving into all the accounts of the exciting adventures that have been happening in the last month. Can’t wait to get out on another adventure. Great roundup, I’m on the bus too, link to April’s outing below. And I’ve just put May’s up tonight…..
I’ll be interested to see how many trip reports you have later on in the year! Hi Gavin, thanks for commenting. I’d all your May post to next month’s round up. Cheers! Hi Jonathan, thanks for this, I’ll add your May post to the next round-up!